What happened to Jimmy Hoffa? How did he simply vanish one day, never to be heard from again? Martin Scorsese's The Irishman, set to be released in the fall of 2019, may provide answers to those questions. The Irishman tells the story of Jimmy Hoffa's disappearance, as well as the role Frank "The Irishman" Sheeran may have played. The prolific nature of the mafia today continues to fascinate the general public, not to mention movie audiences - something to which Scorsese is no stranger. The Irishman purports to offer insights into the fate of one of the most noteworthy organized crime figures in American history while giving viewers glimpses into the underworld itself. To fully grasp The Irishman's true story, you need to be familiar with some of the major players, significant events, and gritty details related to the real American mafia and life in the world of organized crime. James Riddle Hoffa, better known as Jimmy, was a major labor organizer during the 1930s; he became head of the National Teamsters Union during the 1950s. As the leader of the Teamsters, Hoffa aggressively built a centralized organization, often associating with members of underground organizations along the way. Hoffa's ties to organized lawlessness began in Detroit but quickly expanded across the country, and he gained the attention of the FBI as early as 1957. Hoffa was charged with attempting to influence a lawyer who worked for Senator John McClellan in the hopes of swaying a labor racketeering investigation. Though Hoffa was acquitted a year later, he remained under suspicion. During the early 1960s, Hoffa was investigated and indicted several times by the Justice Department; he was found guilty of jury tampering in 1964. After a series of appeals failed, Hoffa went away in 1967. Hoffa served four years of a 13-year sentence, and he was released in 1971. Pardoned by President Richard Nixon, Hoffa was forbidden from taking on any other union leadership positions until 1980. Hoffa didn't take this news well and planned to fight the ruling. But before he could assume any leadership role, Hoffa disappeared from a restaurant parking lot in Detroit, MI, in July 1975. On the day of his disappearance, Jimmy Hoffa was allegedly meeting with Anthony Giacalone and Anthony Provenzano for lunch at the Machus Red Fox Restaurant in Detroit, MI. 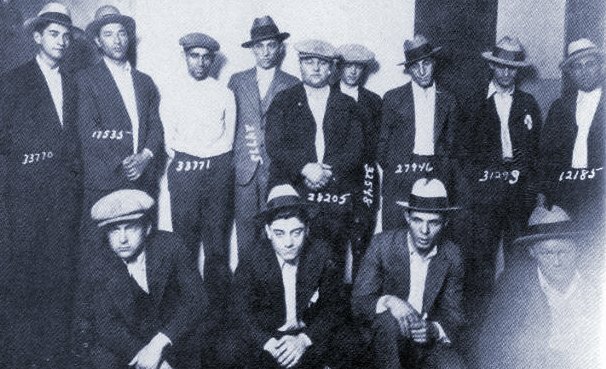 Giacalone was part of a well-known Detroit syndicate, while Provenzano was a Teamster's boss from New Jersey. Once allies, Hoffa and Provenzano had a falling out and it's speculated that they were going to try to mend fences that day. Tony Pro (as Provenzano was known) and Tony Jack (Giacalone's nickname) were immediately suspected in Hoffa's disappearance. As much as I love the guy, Jimmy became an egotistical maniac. It's bad for a guy when he doesn't know how to take a loss... I'm a human being. I just want to be left alone. I don't do anything abnormal. Frank Sheeran claimed he'd flown in from Ohio to meet Hoffa in the parking lot of the Red Fox instead of his expected guests. He allegedly waited for Hoffa with associates Salvatore "Sally Bugs" Briguglio and Russell Bufalino before the group drove off together. When they reached their destination, a house in Detroit, "Jimmy saw that nobody came out of the rooms to greet him, he knew right away what it was," Sheeran said in the book I Heard You Paint Houses. He added that Hoffa tried to flee: "Jimmy Hoffa got shot twice at a decent range... My friend did not suffer." Russell Bufalino introduced Frank Sheeran to Jimmy Hoffa in 1957; Sheeran characterized Hoffa as "one of the two greatest men" he had ever met. Through Bufalino, Sheeran spent more time with Hoffa and was soon put to work for the International Brotherhood of Teamsters. Sheeran recalled the first words Hoffa said to him on the phone before hiring him: "I heard you paint houses." While working for Hoffa, Sheeran claimed he went from Puerto Rico to Chicago to San Francisco all in one day, finally meeting "up with Jimmy" to "give him a report" on the "matters" that he had handled. According to Sheeran's daughter, Dolores Miller, her "father's most cherished possessions was a gaudy gold and diamond watch Jimmy gave him." Towards the end of his life, he told me he wanted absolution. I remember saying he had to be truly sorry for the things he'd done in the past, that if he had his time again, he wouldn't do the things he'd done. He said he was sorry and I drove him to the church to confess. He seemed much happier after that. I felt nothing... the decision was made to 'paint the house' (syndicate lingo for taking someone out), and that was that... you start feeling too much and no matter how much nerve you have the nervous tension builds up in you, and you get confused. Maybe even act stupid. According to Charles Brandt, "Frank could not blink, much less say no [to targeting Hoffa]... Or else they both would have [been taken out]." Sheeran did express both remorse later in life and sadness that Hoffa didn't take steps to stop the hit from happening. From Sheeran's perspective, Hoffa "thought he was untouchable."